Fatigue can be defined by extreme tiredness, as the result of excessive physical or mental exertion, or illness. When feeling fatigued the body is unable to function optimally, leaving sufferers lacking the energy to complete tasks at work or home, which can have detrimental effects on their lives. Though it isn't a disease in itself, fatigue is a condition that should not be overlooked, as it's generally indicative of an underlying medical cause. During puberty, pregnancy, postpartum and menopause, major hormonal changes take place in a woman's life, which can cause fatigue, among other symptoms. 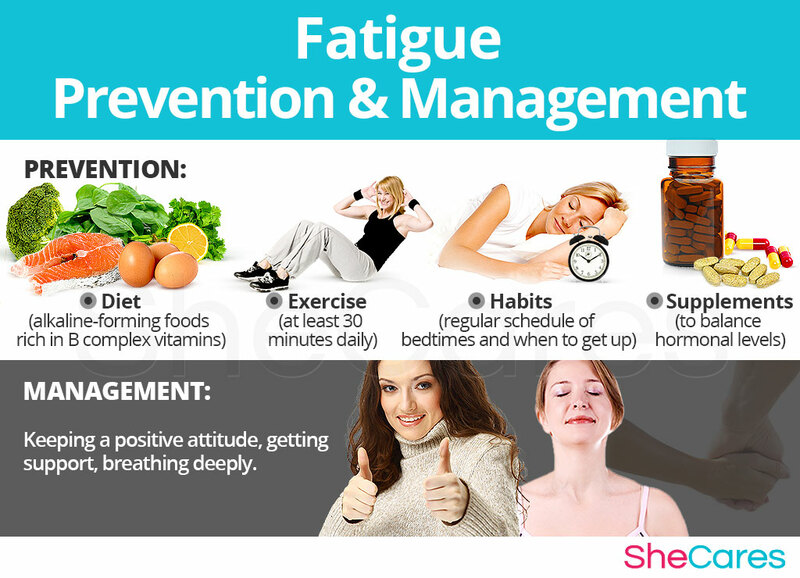 Thankfully, there are many things that a woman can do in order to best prevent and manage fatigue in her life. Continue reading to learn about fatigue, and the causes, risk factors, symptoms, signs, prevention and treatment options available. Approximately 1.5 - 2 million Americans are currently suffering from chronic fatigue. Fatigue is second only to pain as the most common symptom doctors see in patients. Up to 80% of women going through menopause report experiencing fatigue. Approximately 20% of Americans maintain that they have fatigue that interferes with their normal lives. Of this group, 20-60% of fatigue cases are estimated to have physical causes and 40-80% emotional. Fatigue is an ongoing feeling of tiredness or weariness. It can cause a decrease in attention span or the inability to focus, which is sometimes referred to as brain fog or fuzziness. People feeling the exhausting physical and mental effects of fatigue often have difficulty functioning, which leads to a decreased enjoyment of daily life. Fatigue is characterized by lethargy and a lack of energy, rather than sleepiness. It is difficult to measure and accurately assess fatigue, because doctors must rely hugely on the patient's description of the case, rather than a comprehensive physical or diagnostic analysis. Preexisting medical conditions can worsen because of the debilitating effects of fatigue, which can be experienced by people of all ages. Fatigue can be separated into two distinct categories; acute fatigue, which is short term, and chronic fatigue, which is ongoing. If you're feeling extra tired, it can be tempting to take a nap or chug coffee for quick burst of caffeine. However, sometimes the best way to quickly increase your alertness and energy level is to do a bit of light exercise, such as going for a short walk. Researchers tried to find the relative occurrence of prolonged fatigue and chronic fatigue syndrome across race/ethnicity, socio-economic status and gender. Short periods of fatigue can coincide with hormonal changes. Read on to discover the hormonal causes of fatigue. Learning about the causes of fatigue provides the key to understanding how to prevent and treat these troublesome attacks. While the exact causes of the disorder are complex and not completely understood, most doctors and researchers believe hormonal changes are the primary cause of fatigue. In addition to these completely normal hormonal causes, other factors and medical conditions can, in more rare instances, trigger episodes of fatigue. Continue reading to learn more about both the hormonal and additional causes of fatigue. Hormones are chemical compounds that regulate an assortment of functions within the body, such as brain function, growth and sexual reproduction. A fine balance of hormonal levels is required in order for the body to operate as intended, though congenital and external factors can cause a shift in this balance. Thus, higher or lower levels of certain hormones can cause fatigue. Medical researchers have found that fluctuating levels of certain hormones, specifically estrogen and progesterone, can make women more susceptible to frequent, deep fatigue, even after a full night of sleep. This is because these hormones influence the body's levels of melatonin and cortisol, two compounds that strongly influence the quality of sleep and the amount of energy required to conduct any activity. Furthermore, there are also specific factors which can explain the occurrence or severity of fatigue according to the stage of a woman's reproductive life in which the disorder presents itself. For example, during puberty, fatigue tends to be caused by something different than that during menopause. Puberty is the stage in which a girl's body begins to produce reproductive hormones; these and other factors, such as academic and dating pressures, contribute to fatigue during puberty. Pregnancy leads to extreme changes in the production of reproductive hormones, which along with other factors, like mood swings or bodily changes, can lead to fatigue. Postpartum and breastfeeding is another stage where reproductive hormones are imbalanced, leading to symptoms like fatigue. Also, other factors contribute to fatigue in postpartum, like postpartum depression. Menopause is the stage in a woman's life when production of reproductive hormones naturally declines, signaling the end of a woman's fertility. As well as hormonal causes, other factors add to the reasons for fatigue during menopause, including the experience of other symptoms of menopause. Though fatigue can occur throughout a woman's life, and it is most commonly caused by a shift in hormones, it rare cases it can be a sign of a more serious underlying condition, like depression, narcolepsy, thyroid dysfunction and insomnia. Though the most likely cause of fatigue in women is hormonal imbalance, some women are more at risk of experiencing it than others. Keep reading to learn more about the risk factors for developing fatigue. For different behavioral, psychological and health reasons, some women are more likely to suffer from fatigue than others. These predisposing factors can affect a woman's hormone levels and increase the chances that a woman will develop fatigue during her reproductive life. In addition to long-term risk factors, fatigue can also be triggered by other more controllable habits and environments. Avoiding these habits and better managing one's reaction to these unhealthy environments may help to decrease the onset of fatigue symptoms. Continue reading to discover more about the most common signs and symptoms of fatigue. Many people who have been diagnosed with chronic fatigue syndrome have actually been found to be suffering from a heart problem that changes the heartbeat when the person sits or stands. This causes exhaustion that is mistaken for CFS, so be sure to ask your doctor to explore every possibility to receive the best diagnosis. There are a variety of medical signs and symptoms that help to identify fatigue. Keep reading to learn more about the medical signs and symptoms of fatigue, and what to expect during a doctor's visit. Estrogen levels: Hormonal imbalances can be caused by estrogen, especially during puberty, pregnancy, postpartum and menopause. The changing levels of estrogen in a woman's body during these periods may result in fatigue. Time and duration of symptoms: It might be a good idea to record feelings of fatigue in a journal. Include when it occurs (time of day, and how frequently), food consumed, stress levels, exercise and any additional relevant information. This may help to establish a pattern, to see if fatigue is caused by something manageable, like overeating or stress or work. A doctor will also perform three procedures in order to diagnose and identify fatigue. They will review the patient's medical history, conduct a physical exam and finish with a psychological evaluation. If necessary, additional tests may be ordered. Infrequent, mild cases of fatigue can occur as a natural past of the hormonal changes associated with a woman's menstrual cycle. However, chronic fatigue caused by hormonal imbalance can interfere with the quality of a woman's life. In rare cases, when chronic fatigue is left untreated, it can lead to certain complications, which are more risky for a woman's emotional and mental health. These possible, but uncommon, complications of fatigue can include depression or a reduced reaction time, and they have some specific warning signs. Women who experience frequent symptoms of extreme fatigue that are interfering with their daily lives may wish to treat or learn how to prevent them. Keep reading below to learn useful techniques and habits that will prevent fatigue or make it more manageable. Because there is no official test for chronic fatigue syndrome and the condition is not fully understood, many people dismiss sufferers as lazy. However, it is a real medical condition that can be diagnosed and treated. Modifying your diet is a possible first step in managing fatigue. There are many different things that a person suffering from fatigue can do to prevent and manage symptoms. While there is no one single cure for fatigue, there are changes that a woman can make in her life, which will help to decrease the mental and physical effects of fatigue. Lifestyle changes are the first line of treatment available, and are very important to treating fatigue. Focusing on diet, exercise, and healthy habits can have a huge impact on a woman's experience of fatigue. In addition, women can seek to enhance these lifestyle approaches with the use of the right supplements to help them keep their endocrine system in good shape and, therefore, help prevent or ease symptoms of hormonal imbalance, such as fatigue. When a woman happens to be experiencing fatigue, there are things that she can do to manage it effectively. 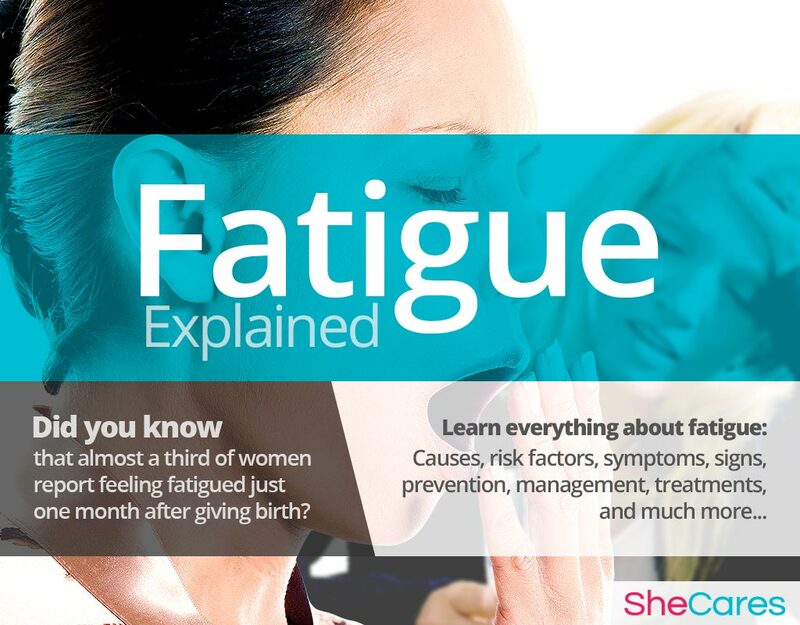 Working to avoid triggers and making simple changes can greatly impact a woman's experience with fatigue. Alternative treatments are also a great way to alleviate the symptoms of fatigue. This type of treatment will not get to the root cause of fatigue, which is hormone imbalance, but will generally decrease symptoms in the short term. Alternative treatments for fatigue include acupuncture and relaxation therapy. While these measures often help to reduce the symptoms of fatigue, they are unable to treat the root of the problem, which in most cases is hormonal imbalance. However, there are several natural treatments that can treat the hormonal causes of fatigue. Please continue to the next section to learn more about treating mood fatigue. Chronic fatigue syndrome, while known for causing extreme tiredness and exhaustion, also has other symptoms, of which many people are not aware. Some natural supplements, while they are not miracle cures, can help to address these symptoms and alleviate fatigue. Find out more about these natural remedies. Qigong specifically improved chronic fatigue symptoms like sleep disturbances, limited mobility and pain after three months of practice. The treatment of fatigue, whether acute or chronic, is important in order to prevent it from getting worse, or becoming an ongoing problem. There are three levels of treatment for fatigue, which are (1) Lifestyle Changes, (2) Alternative Medicine and (3) Pharmaceutical Options. It is always recommended to start with the least risky approach, lifestyle adjustments, which tends to be the least expensive and invasive, and then proceed to the next level of care. While medical intervention is not usually necessary to treat fatigue, some women who are unable to find relief from lifestyle changes and alternative medicine may wish to consider pharmaceutical options, after properly evaluating the risks associated with such a treatment. Most cases of acute fatigue can be reversed by rest. Because different people require different amounts of sleep for optimum functioning, it is best to aim to have sleep that is refreshing, instead of hitting a specific number of hours each night. It is fine to take naps, as long as they are not longer than one hour, which will cause grogginess and likely a subsequent inability to sleep during the night. However, a quick 10 minute can be enough to make a difference in energy levels and lessen fatigue symptoms. While lifestyle changes alone can decrease the intensity of frequency of fatigue, they do not directly address the hormonal imbalance underneath it. Alternative medicine has proven to be an excellent way of treating fatigue and hormonal imbalances in a safe and natural way. Alternative medicines and supplements involve minimal risk and can be effective ways to treat fatigue. There are two different types of herbal supplements available; phytoestrogenic and hormone-regulating herbal supplements. Phytoestrogenic herbs like black cohosh and red clover contain estrogenic components that are produced by plants, and add estrogen to the body. These herbs are mainly effective to help women suffering from hormonal imbalances related to low estrogen levels, but are not recommended for long term use because they may make a woman's body less capable of producing its own estrogen. Furthermore, they are not necessarily effective for women suffering from other types of hormonal imbalance, or going through puberty or pregnancy. Hormone-regulating herbal supplements, including Macafem, stimulate a woman's hormone production without containing estrogen, by directly nourishing the pituitary and endocrine glands, promoting a more efficient hormonal production. These supplements can be considered the safest and most natural way to treat the underlying hormonal imbalance behind fatigue, and can be taken throughout a woman's life, as they support the body's natural hormone production. In addition, there are other types of herbal supplements that can make fatigue symptoms easier to manage. A combination of approaches is usually the most effective route to take. Lifestyle changes combined with alternative medicine will most likely be the best way to alleviate the symptoms of chronic fatigue. However, for some women the symptoms will be so severe that a drastic treatment is necessary. If neither lifestyle habits nor alternative treatments provide any relief from fatigue symptoms, it may be necessary to take drugs recommended by a healthcare professional. However, pharmaceutical interventions involve the highest risk and often the highest costs and not all treatments are suitable for women at every life stage - many medications can be risky for women who are pregnant or lactating. It is strongly recommended to speak to a licensed physician before starting any pharmaceutical treatments for fatigue. There are three main types of pharmaceutical options that can be prescribed to treat fatigue, hormone-regulating medication, non-steroidal anti-inflammatory drugs (NSAIDS) and mood-regulating medication. These three approaches are not mutually exclusive. A woman may use different approaches at different times or any combination of them, depending on the duration and severity of symptoms. Today more and more women find that dealing with symptoms of fatigue related to hormonal imbalance is best accomplished via a combination of healthy lifestyle and alternative treatments.